This special 2100 model from Rice Lake is enhanced with a four-point spring plate suspension, to minimize shock and overload damage. For increased durability, the 2100SL is an economical and durable checkweighing device. This special 2100 model is enhanced with a four-point spring plate suspension, to minimize shock and overload damage. For increased durability, the 2100SL is an economical and durable checkweighing device. A sound investment for common checkweighing tasks, the IQ plus 2100SL features simple two button operation. Use the Rice Lake IQ plus 2100SL for bakeries, portioning, kitting, or many other light industrial checkweighing needs. This special 2100SL model from Central Carolina Scale is enhanced with a four-point spring plate suspension, to minimize shock and overload damage. 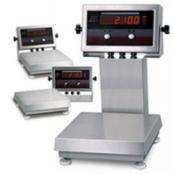 For increased durability, the IQ2100SL is an economical and durable checkweighing device. 65177.............10 in x 10 in............... 20 x 0.005 lb/10 x 0.002 kg/ 10,000 x 2 g/320 x 0.1 oz. 65179.............12 in x 12 in............... 30 x 0.01 lb/15 x 0.005 kg/ 15,000 x 5 g/480 x 0.1 oz. 65180.............12 in x 12 in............... 50 x 0.01 lb/25 x 0.005 kg/ 25,000 x 5 g/800 x 0.20 oz. 65186.............12 in x 12 in............... 30 x 0.01 lb/15 x 0.005 kg/ 15,000 x 5 g/480 x 0.1 oz. 65187.............12 in x 12 in............... 50 x 0.01 lb/25 x 0.005 kg/ 25,000 x 5 g/800 x 0.20 oz.